Aventine Renewable Energy installs a CompuWeigh SmartTruck system to automate their renovated ethanol plant. Sunrise Cooperative reduces truck processing time to 6.4 minutes with CompuWeigh's SmartTruck system. Deerfield Ag Services installs a CompuWeigh SmartTruck system, bulk weigh scale and control system. MFA opens new rail terminal on Union Pacific including a CompuWeigh SmartTruck system and bulk weigh scale. Flint Hills is seeing positive returns from installing CompuWeigh's SmartTruck system at its ethanol plants. Read three testimonials from actual CompuWeigh SmartTruck customers about how SmartTruck has helped their business. ND, Finley: Finley Farmers Grain & Elevator Co.
Finley Farmers designs a citywide truck routing system revolving around CompuWeigh’s SmartChoice software module. NE, Hemingford: Farmers Coop Elevator Co.
SmartTruck has helped Farmers Coop in terms of weight and grade accuracy, better traffic management, better segregation according to grain quality, and overall less stress. Hankinson Renewable Energy credits its outstanding performance to the facility’s high degree of automation, notably the plant’s CompuWeigh SmartTruck system. SmartTruck System cuts truck processing time from 5-6 minutes per truck down to 3 minutes at Maple River Grain. CompuWeigh SmartTruck system cuts truck waiting time in half at Full Circle Ag. Dakota Plains Ag Center reduces truck wait time by installing a CompuWeigh SmartTruck system. CompuWeigh's SmartTruck system makes it dramatically easier to route trucks through BTR Farmers Cooperative's facility. 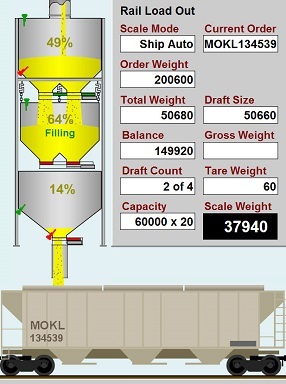 IN, Edinburgh: Kokomo Grain Co.
Kokomo Grain uses SmartTruck system to remove bottleneck and keep trucks moving. Eastern Grain Marketing installs a new CompuWeigh SmartTruck system which allows a card reader to scan the driver’s RF tag, and provides data on the truck and contents to interface with their accounting system. CompuWeigh's SmartTruck automation system captures weight and grade data and directs the driver to one of two truck receiving pits. Rail terminal speeds up grain receipts, improves scale ticket accuracy with SmartTruck system. Crystal Valley Coop now processes up to 500 trucks per shift with the addition of CompuWeigh's SmartTruck system. After using CompuWeigh's GMS truck management software since 2001, Alton Grain decided to also upgrade to CompuWeigh's truck management software. To automate the inbound and outbound scales and coordinate the traffic flow, AC Grain selected a SmartTruck scale automation system from CompuWeigh Corp., Woodbury, CT.
Upgrades at West-Con now allow the coop to ship its wheat and soybeans to terminals on the Mississippi River and facilities in Chicago, IL. It also can ship corn to the Pacific Northwest or to feed markets in the West and South. SmartTruck is helping Aventine Renewable Energy process more trucks in less time, saving time and money.